Liquid nitrogen ice cream beats the heat and turns a profit for small business owners. 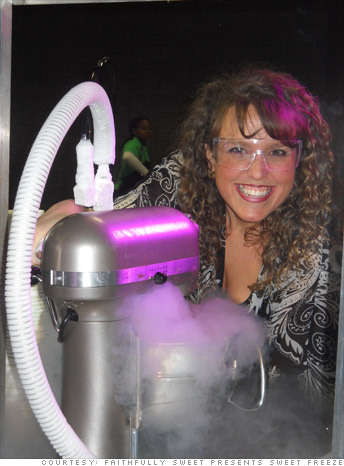 Faith Holmes, owner of Faithfully Sweet Presents Sweet Freeze, shows how to make liquid nitrogen ice cream. Summer may be ending but a good scoop of liquid nitrogen ice cream can be enjoyed year-round. Liquid nitrogen ice cream. Ice cream makers nationwide are using food chemistry to transform this favorite dessert into a funkier, high-tech, customizable indulgence. Using KitchenAid mixers tricked out with liquid nitrogen tanks, creameries turn simple ingredients like milk, sugar and fruit into made-to-order ice cream in under a minute. The blend rapidly chills as liquid nitrogen -- with a boiling point of -320 degrees -- instantly vaporizes in a billowing, Phantom of the Opera-esque fog. When the cloud evaporates, the ice cream is ready. The speedy process boosts taste. The quick freeze means ice crystals don't have as much time to form, explained Aaron Goldstein, a chemist and Virginia Tech professor. "Consequently, they're really small, which makes the texture of the ice cream seem more creamy and less icy," he said. The result is scoopable ice cream that has supported franchises like Sub Zero Ice Cream and Blue Sky Creamery from Georgia to Arizona to Washington state. Now, liquid nitrogen, plus cream and almost limitless flavor options are fast becoming a recipe for success for local parlors and catering firms.